WELCOME TO THE OFFICIAL SNOW JOE&###xAE; + SUN JOE&###xAE; FACTORY OUTLET STORE. SAVE BIG ON CERTIFIED REFURBISHED SNOW JOE + SUN JOE TOOLS! Meet iON&###x2019;s big brother – iON PRO, an amped up version of the original battery-powered snow blower. Like iON, the iON PRO 18-inch snow blower is ideal for clearing snow off driveways, sidewalks and decks without the hassle of gas, oil, tune-ups, frustrating pull-cords or tangled extension cords. And, with an upgraded interchangeable and rechargeable 40 V iONMAX 5.0 Ah lithium-ion battery, iON PRO delivers up to 65 minutes of whisper-quiet runtime on a single charge, so you can get larger snow jobs done without waking the neighbors or polluting the air with toxic emissions. This cordless dynamo is also engineered with a powerful 500 W brushless motor for increased battery efficiency, optimal motor performance and extended motor life to keep iON PRO blowing strong season after season. ION PRO starts instantly with a simple push of a button and its adjustable handle maximizes user comfort during use. Equipped with a steel auger and 2 heavy-duty rubber blades, iON PRO moves up to 495 pounds of snow per minute, clearing a path 18-inches wide by 8-inches deep with each pass. Plus, the scraper bar at the base of the unit lets you clear right to the ground without damaging your deck or pavement. Featuring a 180&###xB0; auto-rotate chute that rotates instantly with the push of a switch, iON PRO directs the snow stream up to 20 feet away. Compared to heavier and more cumbersome gas machines, iON PRO weighs only 32 lbs, so you can easily carry it onto your snow-filled deck to clear out fast. For nighttime snow removal, iON PRO features an integrated LED headlight that quickly switches on to increase visibility. GET EQUIPPED&###xAE; this winter with the Snow Joe&###xAE; iON PRO &###x2013; the easy, convenient and cordless solution to get snow out of your way on your snow day. Lightweight design (only 32 lbs) to easily clear sidewalks, driveways and decks. 40 V iONMAX 5.0 Ah rechargeable lithium-ion battery provides up to 65 minutes of whisper-quiet runtime and is compatible with all iON tools. Featuring exclusive EcoSharp&###xAE; technology for no fade power and maximum performance. No pull cords, gas, oil, tune-ups, carbon emissions or tangled extension cords. Steel auger with 2 rubber blades moves up to 495 lbs of snow per minute; cuts a path 18 in. Wide by 8 in. Deep without damaging surface. 180&###xB0; auto-rotate directional chute throws snow up to 20 ft. 3 W LED headlight provides increased visibility for nighttime snow removal. Powerful 500 W brushless motor optimizes motor performance and increases battery efficiency. Thanks for your interest in the Snow Joe Factory Outlet. We offer products in the following conditions:&##xA0. (Each listing may vary, please check the items&###xA0;details). This item may or may not be in the original packaging. An item that has been used previously. The item may have some signs of cosmetic wear, but is fully operational and functions as intended. This item may be a floor model or store return that has been used. A brand-new, unused, unopened, undamaged item in its original packaging (where packaging is applicable). A new, unused item with absolutely no signs of wear. The item may be missing the original packaging, or in the original packaging but not sealed. &###x200B;&###x200B;&###x200B;&###x200B;&###x200B;&###x200B;&##x200B. Refer to the map below. Please review the item listing for specific details. If you are missing any parts, or need replacements, we will gladly provide those items upon request. Any product you return must be in the same condition you received it and in the original packaging. Please keep the receipt. Snow Joe&###xAE; + Sun Joe&###xAE; Factory Outlet. Super Savings – UP TO 90% OFF Everyday Price! Check out an electric chain saw. Put your hands on a cordless pressure washer or pole saw. Here&###x2019;s your chance to have an up-close-and personal experience with the hottest new and nearly-new yard and garden gear – all at huge savings! From new and refurbished to open box, scratch + dent, overstock or factory certified, you&###x2019;ll find deep discounts on top-quality, innovative tools from the brains and brands that created the eco-friendly category in outdoor tools. High quality, eco-friendly battery + electric outdoor winter-weather tools. Innovative, eco-friendly lawn and garden tools for the spring, summer and fall. Cutting-edge irrigation products and watering accessories for your home, yard and garden. Japanese professional grade, precision-milled home + garden tools. Martha Stewart has teamed up with our experts to bring you the very best tools for your home, yard + garden. Power on demand with a complete line of Portable Generators + Accessories. New items just for you &###x2014; just as good as ordering online, but with instant gratification! Give Preowned items the loving homes they deserve. Our certified factory technicians have given these products their stamp of approval. Winter, spring, summer, fall &###x2013; we have it all! Snow Joe&###xAE; + Sun Joe&###xAE; design and create innovative outdoor tools to keep your home, yard and garden looking beautiful throughout the year. From battery-powered hybrid snow blowers and snow throwers, lighted snow brooms and roof rakes, to electric mowers and leaf blowers, pressure washers, tillers, trimmers, hedgers and edgers – there&###x2019;s a solution for every season. Go With Joe – and get equipped with the right tools to tackle everyday household chores. The item “Snow Joe Cordless Snowblower 18-Inch 40V Battery & Charger Included” is in sale since Sunday, February 10, 2019. This item is in the category “Home & Garden\Yard, Garden & Outdoor Living\Outdoor Power Equipment\Snow Blowers”. The seller is “snowjoe_factory_outlet” and is located in Carlstadt, New Jersey. This item can be shipped to United States. 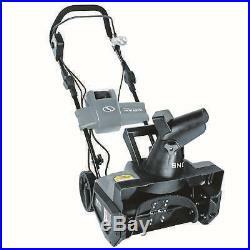 Tagged with 18-inch, battery, charger, cordless, included, snow, snowblower.